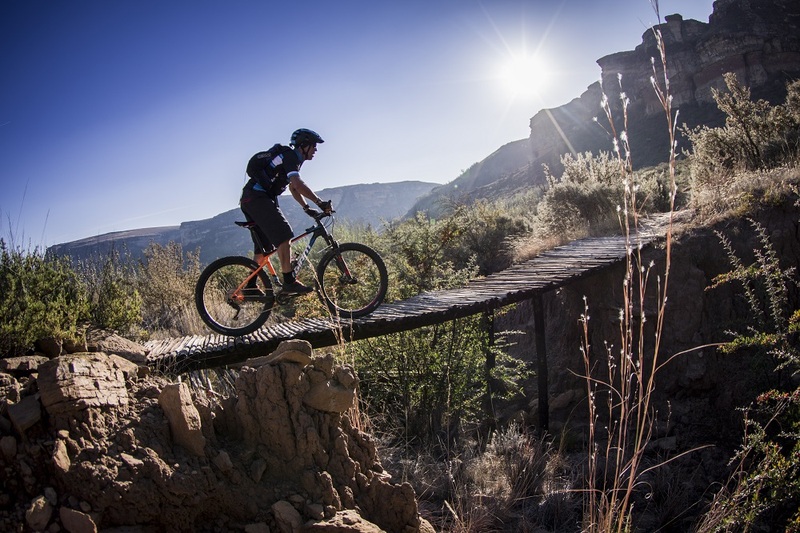 Heads up, peeps … this is a proper MOUNTAIN bike trail, so you better bring your climbing legs. The route itself is serenely beautiful and varied, with 98% singletrack great for riders keen to push their technical capabilities. Excellent views are guaranteed along the ride and you can expect the 10km option to take you at least an hour to 90min. The mountain biking trail is a relatively new addition to Camelroc, and you have the option of two routes. A shorter 10km figure-of-eight route trips along the ridges within the farm boundaries, making full use of the steepening ridge lines here in the eastern Free State. Everything goes, from wooden bridges, rocky plateaus and near impossible inclines, and it will take guts (and sizeable cojones) not to put your foot down on your first circuit. The second route is 30km, with some short-cut options to reduce the route to either 10km or 20km in distance. This route is damn tough, with an extreme climb right from the start that is sure to severely spike your heart rate. And don’t think it’s “flat” once you reach the mountain summit circuit, either. Both trails start from just outside the lodge, and are pretty well marked, with Blue, Green and Red colour-coding showing the way. The longer route to the mountaintop is more of a hiking trail and segments of it need to be cut down annually to make it rideable – check first before you crank skywards. Both trails are predominantly singletrack and – depending on your level of fitness and skill – would be termed Intermediate to Advanced. Riders are therefore advised not to ride beyond their capability (read: if in doubt, get off and push). You will however find that the more you ride it, the easier it becomes to get your rhythm. All in all, the trail has been well laid out with great variety.